This gulet cruise explores the virtually untouched coastline of ancient Lycia, on Turkey’s breath-taking turquoise coast. The tour includes well-known highlights like the marble-clad city of Perge, where archaeologists are unearthing a site to rival Ephesus, Myra, with some of the finest rock-cut tombs and Xanthos, a vast fortified citadel city that dominated the region for centuries. Travelling below the soaring Taurus Mountains, we will discover the extraordinary heritage of one of antiquity’s most mysterious peoples: the Lycians. Their enduring sense of identity prevailed for centuries, even as they adopted and adapted Persian, Greek and Roman cultural influences. It found expression especially in their unique funerary architecture, unlike anything else in the world, their tombs and sarcophagi still scattered around their once prosperous ports. We find many of them lying in rugged settings, seemingly untouched by human hands. Others are set within modern settlements, such as the lovely resort of Kaş, where rock-cut tombs, shaded by vibrant red bougainvillea, stand silent witness to the ancient city of Antiphellos. Average rating 5 out of 5 from 372 reviews for Cruising the Lycian Shore, according to AITO reviews. Day 1: Our boat is about 30 minutes from Dalaman airport in the pretty harbour of Göcek. Welcome dinner on-board. Day 2: A chance to unwind in the Bay of Fethiye. Day 3: We cruise through the stupendous Bay of Fethiye, ancient Telmessos, with ample time to swim, relax and admire the scenery of sea and mountains, before visiting Gemiler Island, where Japanese archaeologists have revealed an extraordinary Byzantine pilgrimage centre, perhaps connected with St. Nicholas of Myra, with multiple chapels and churches linked by a most unusual long vaulted corridor that ascends towards the island’s summit. Day 4: On to Kaş, a beautiful town of whitewashed houses shaded with lush purple bougainvillea. Scattered among and around the modern settlement are the remains of the ancient city, Antiphellos: some remarkably fine sarcophagi and rock-cut tombs, a temple and a well-preserved theatre with a magnificent sea view. Day 5: East to the picturesque village of Üçağız, old Teimiussa, one of the most evocative of all Lycian burial sites. A jumble of ancient sarcophagi, cut from the area’s craggy limestone, lines the shore, overlooked by a tiny fortification. Many of them bear fine relief decoration. Day 6: We travel into the mountainous interior to visit Arykanda. Here, Turkish archaeologists are uncovering a large Greek and Roman city in a spectacular setting of slope and forest, often likened to Delphi. The monumental baths, the perfect little Greek theatre and adjacent stadium, and the unusual series of tombs make Arykanda a highly memorable place to explore. Day 7: We continue to Phaselis, at times the seat of pirates who terrorised the region’s rich trade routes. Its three harbours now lie serene amid pine trees and there is much to see of the ancient city’s centre with its impressive public buildings. Day 8: On to Antalya, the south’s most vibrant city. We visit its super archaeological museum, a treasury of Roman sculpture. We’ll also explore Roman Perge, a vast and stunningly monumental Greek and Roman city. We stroll through colonnades and markets, marble-clad bathhouses and a pristine stadium, all overlooked by massive fortifications. Day 9: We turn back southwards to ancient Olympos, an ancient city in a most unusual setting along the banks of a river in a canyon. We follow an ancient sacred route to visit the Chimaera, a natural phenomenon where flames burst from the ground, giving rise to the legend that the mythical beast of that name lies buried beneath the earth. Day 10: We visit Myra, home of St Nicholas, famed for its near-complete Roman theatre and superb rock-hewn tombs. Walking through its port, Andriake, we discover a giant cistern and granary built by the Emperor Hadrian, as well as an ancient synagogue and a huge purple-dye workshop. Day 11: We return westwards, travelling along the sunken Byzantine city of Kekova to romantic Kale, a tiny fishing village built upon the ruins of ancient Simena and surrounded by its cemeteries of sarcophagi and rock-cut tombs. The Ottoman castle, built upon an ancient citadel, offers superb views across the region. Day 12: We set off for the picturesque resort of Kalkan. From here, we travel inland to Xanthos, occasional capital of ancient Lycia, where archaeologists have been digging for half a century. Great fortifications surround a vast ancient city, unusually also including part of its cemeteries, with some of the finest of all Lycian tombs. Among them are the extraordinarily elaborate and unusual pillar tombs – a remarkable sight. Day 13: We travel to Patara, initially a harbour town dependent on Xanthos, later the Roman capital of Lycia. Here, the sand dunes that have protected the ruins for centuries have been gradually shifted to uncover an astonishingly rich ancient city, with an enormous theatre, a vast granary, column-lined streets and its stunning Roman lighthouse, one of the oldest extant examples in the world. A unique highlight here is the bouleuterion, the plenary chamber of the Lycian confederation, an ancient political entity well ahead of its time. Day 14: After a leisurely morning given over to swimming and relaxation, we moor at Fethiye, ancient Telmessos, where we explore the monumental Temple Tombs, probably the resting places of local royalty, before ending the tour with a sumptuous farewell meal on board the boat. Day 15: Transfer to Dalaman airport, about an hour away. We recommend you arrive at the gulet in Göcek (approx 30 minutes from Dalaman airport) in the late afternoon/evening. Embarkation is from 17:00 onwards. You are more than welcome to arrive earlier to drop off your bags, but please be aware that the crew will be busy cleaning and tidying making everything ready for your group so you may not be able to settle in to your cabin. Departure time can be subject to change depending on weather, harbour or other conditions. Disembarkation in Fethiye (approx 60 minutes from Dalaman airport) is around 09:00. We will arrange local transfers from Dalaman airport and to Dalaman airport on the first and last day of the tour. If you are staying in or connecting via Istanbul then the easiest way to get to and from the gulet is to fly. There are a number of airlines that offer domestic flights in Turkey such as Turkish Airlines. Turkish Airlines has a wide selection of flights on these days and there are alternative flights to and from Istanbul with some of Turkey’s low cost airlines such as Atlas Jet, and Onur Air. The cheapest way to book flights is directly with the airline online. Visas are easily obtained online at eVisa and must be purchased before you travel. If you are planning to stay in Istanbul before or after your gulet tour we have included below links to more information and things to see and do. If you are thinking of extending your trip to Turkey to include visits to Cappadocia, Ephesus, Istanbul or further afield, please contact our office for further information. This was the best vacation of my life (and I haven't been the least bit deprived!). I learned more in these two weeks in Turkey than in any year in college with the best professors, and I absorbed it in a way that will continue to inform my understanding of the world for the rest of my life. 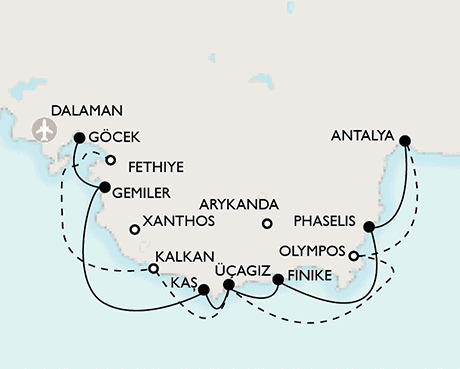 Excellent itinerary, beautiful anchorages... So enjoyed the combination of idyllic leisure with a learning experience... My two weeks on the gulet were some of the happiest in my long generally happy life. It was one of the most comfortable sailing experiences I've had. A flawless operation. Your enthusiasm, imagination and knowledge made the experience extraordinary. Thanks for a truly amazing experience. I cannot thank you enough.